Duma Nokwe became the first black member of the Johannesburg Bar on March 9, 1956, but apartheid's inherent lack of logic made it almost impossible for him to practise as an advocate at what was then the Johannesburg Supreme Court. Other advocates objected to his application, including BJ Vorster, who later became prime minister. Then a "native commissioner" turned down Nokwe's application to have offices, known as chambers, in His Majesty's Building, where all the white advocates had theirs. It was a Supreme Court rule that chambers had to be within reach of the court, but Nokwe was instructed to take chambers in a "native residential area". As this would have made it impossible for him to practise, the Bar Council approached the Minister of Native Affairs - the "architect of apartheid", HF Verwoerd - but Verwoerd refused to receive a deputation from the Bar Council to discuss this. Advocate George Bizos came to Nokwe's rescue and, illegally, shared his chambers with him from 1956 to 1962. Considered by his peers to be "witty, urbane" and one of the ANC's ablest politicians, Nokwe became secretary-general of the organisation in 1958. He was one of the 30 accused in the Treason Trial and, together with Nelson Mandela, he conducted an informal defence for the trialists. Nokwe was constantly harassed by police during the treason trial, which lasted more than four years. This, coupled with a five-year banning order under the Suppression of Communism Act, which was extended in 1959 for another five years, caused Nokwe's legal practice to collapse. 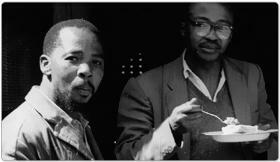 President Thabo Mbeki was a close friend and before Mbeki went into exile he lived with the Nokwe family for 18 months.